The Perry Oaks sludge works. 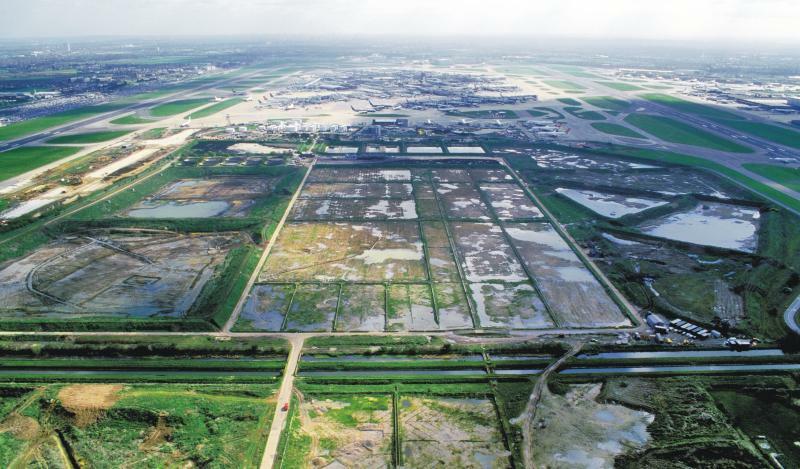 One of the earliest phases of the archaeological work at T5 was the recording and interpretation of the disused sludge works at Perry Oaks. Built in the 1930’s the development of the plant is testament to the unprecedented population growth seen in the late 20th century. When the plant was constructed in 1934 it was the equal of any of the most advanced plants found in Germany and the USA. By the time of its demolition in 2002 the plant had undergone a series of changes reflecting the development of waste treatment techniques. The early circular concrete tanks were supplemented in 1952 with large rectangular tanks and later by a series of lagoons. The introduction of centrifuges in the late 1990’s eventually made such features redundant. In 1965 the manual process of emptying the 72 acre drying beds was mechanised by the installation of mobile shovels and a traveling elevator. The site also saw changes in the way that sludge was transported. In 1937 a portable 2ft gauge railway was in use on the beds. Dried sewage “cake” was, until 1940, dumped on site but the shortages during WWII created a demand for the material as an agricultural fertilizer. By the 1960s a special dried sludge storage area had been constructed. This was augmented by the installation of a conveyor system in 1965 but again both were made obsolete by the introduction of centrifuges able to discharge directly into parked trailer units. Both the construction and operation of these works were described in detail in Institution of Civil Engineers papers 5120 and 5599. This entry was posted in Uncategorized and tagged modern, sludge. Bookmark the permalink. These images shows the T5 construction project in relation to the Treatment Works. Between 1957 and 1964 I lived with my family at 1, Perry Oaks. This was one of only four MOD houses sandwiched between the sewerage works and the airport.The planes, very noisy then, went right over our houses to land.Number 4 Perry Oaks had it’s chimney knocked off by one ! I have a photo of the flower-filled front garden ,which as a child I used to play in, now Terminal Five.The airport was superb for mushrooms, I used to hop over the fence and pick some for breakfast.In 1963 we were snowed in for days, the snow right above the doors of the house. My family lived at number 4, for years has anyome got pictures of Perry oaks? I was really interested to read that you lived in Perry Oaks until 1964. I had no idea families were living there until then. 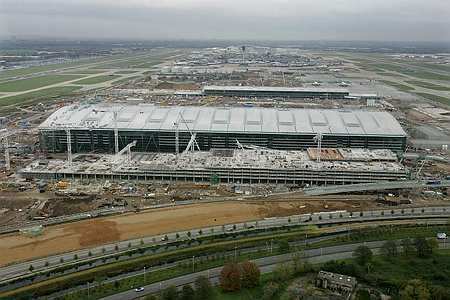 It sounds very strange (and no doubt even stranger to you) that you lived where Terminal 5 now stands. I admit that I have become slightly obsessed with what Heathrow and the surrounding area was like pre airport and yours is the only first hand account I can find so far. Would love to hear more and see the photograph!